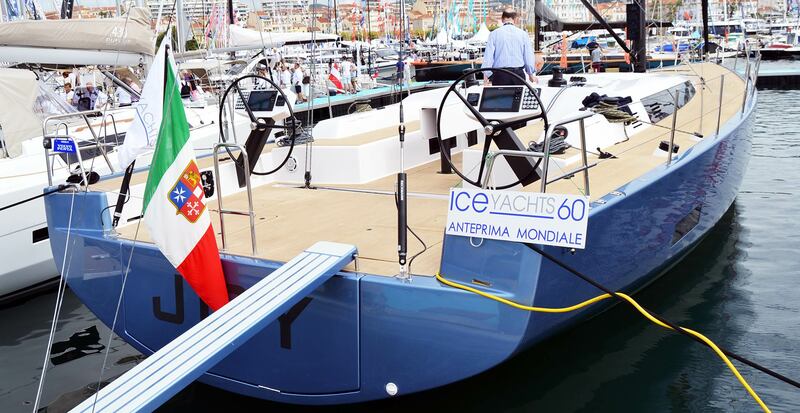 Last day of this year´s visit to the Cannes Yachting Festival and I took the time to knock at the transom of this wonderful blue-painted ICE 60 performance sailing yacht which had her world premiere at the show. And thank God I did because she turns out to be one of my most fancied yachts of Cannes boat show 2018 (read here about Cannes 2017 and 2016). I was happy to be greeted by the designer of the ICE-yacht himself, Umberto Felci, whom I admire for his work and had the pleasure to talk to during past boat shows (read my article on interior design & naval architecture with Umberto here). We agreed to show me around and was seemingly proud of his work on the ICE 60. Which I can perfectly understand: ICE Yachts is not a big production boat producing company and has a strong connection to semi-custom building of high-quality yachts. In consequence, there is not such a strong constraint to a design briefing dictated by a large cross section of the mass market – hence, more freedom in adhering to own principles and possibly more room for experiments and somewhat extreme solutions. Looking at the ICE 60 from stern to bow very classy lines with a somewhat voluminous hull reveal a conservative approach to the design. Open transom, double steering on nicely done thin steering posts, a flat black stripe that is the salon window and three simple rectangular porthole windows in the hull underline this emphasis. But there are also nice little touches of a more aggressive and extravagant design. The bow is an homage to the Volvo Ocean Race Open 70 yachts which thwarts the somewhat “mild” aggressiveness of the hull design. I especially admired the nicely integrated bowsprit. The whole bow-section together with the huge frontal skylight-window of the forward cabin roof, the nicely shaped stern section with elegantly pitched chines are adding up to a – from my point of view – completely different look of the boat. Bow – racer, stern – cruiser. If intentional, it´s ingenious! And indeed the ICE 60 was conceived to be a serious performance cruiser. Looking at the huge wide open cockpit I instantly notice that all the winches had been positioned in a very classy way: Main halyard winches on the roof next to the companionway, Jib/Genoa winches right in the middle of the bench area and secondary and spi-winches right in front of the steering posts. This layout is meant to be operated by a racing crew. 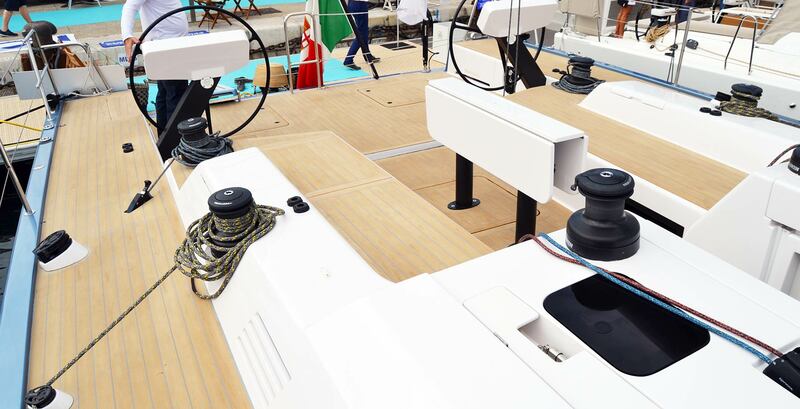 And it perfectly makes sense: Where on production boats the trend is going to the complete opposite direction in having as less winches as possible and if so, every line diverted back to the steering, it´s the opposite with ICE: This boat is made to be sailed by a crew. Old school. Her aspiration not to be overtaken on any point of sail is also imminent when looking at the rig: A full carbon mast with a nicely done carbon boom is without question something you have to have on a boat like this. 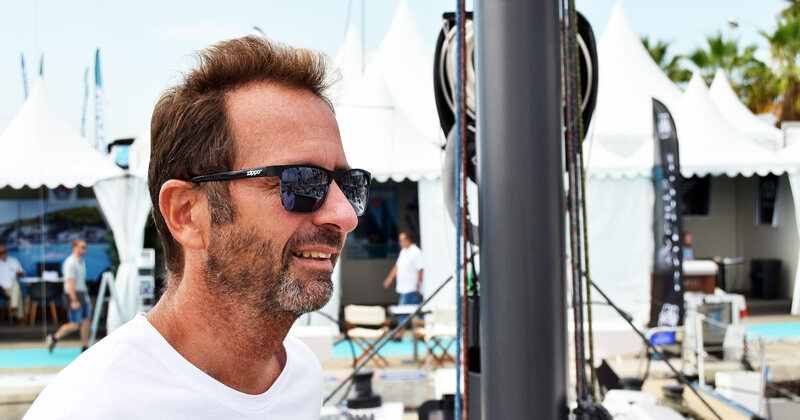 Of course, the owner of JOY wanted to have the boat fitted with a boom roller-mainsail, which I personally cannot understand, but Umberto assured me that the sailing performance magically didn´t suffer – on the contrary! Down below I was greeted with the anticipated large volume. 60 feet length generate such an interior volume that I find most of the yachts I´ve visited don´t really “know” how to cleverly use this room. 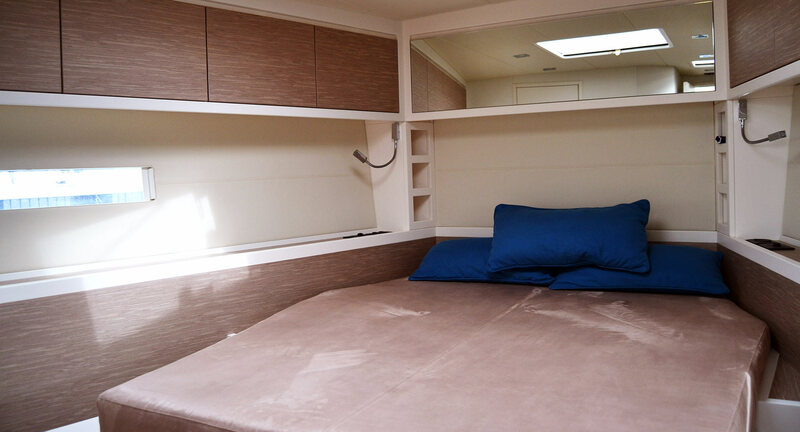 On the ICE 60 the internal layout is quite conservative but with a subtle change: The galley has been moved forward to the main bulkhead. This creates a cozy atmosphere right upon entering the salon – but also stretches the distance to a refreshing drink or a snack if a crew member quickly wants to dash down. Again, some – that´s my personal opinion – questionable choices of the owner of this boat concerning colours perplexed me, but just for a very brief moment. ICE 60 has a very clear and tidy approach to interior design: Square forms, rectangular shapes. Plain white and lacquered surfaces, some veneered with a synthetic layer in a (strange) colour. Absolutely gorgeous and so comfortable is the cushion on the large sofa and U-settee in the salon! Absolutely loved it. I stumbled upon the fact that on the ICE 60 the nav station has been reduced to a mere small table, facing backwards and a considerably small main switch panel – clearly, the focus is not on the proud owner working his ship on the ICE 60 but more on the proud owner being up on deck sailing her fast! This is what I would call STANDING HEIGHT! Look at this aft cabin: A true playground! What. A. Big. Cabin! I don´t know what to say but I guess these have been the biggest beds I´ve ever seen in aft cabins so far! 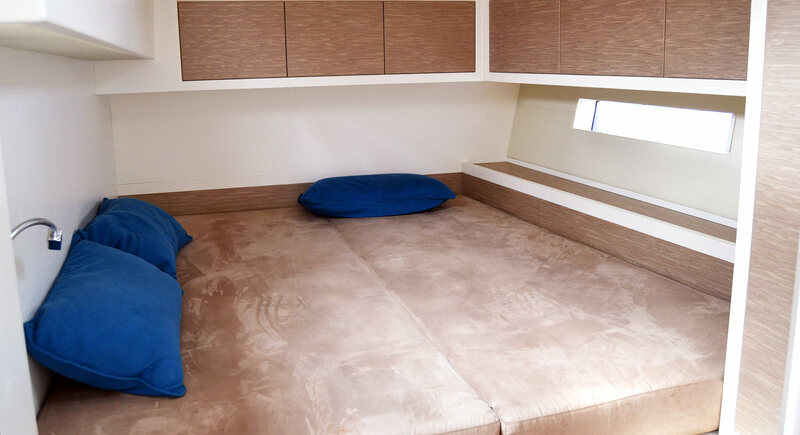 You could easily fit three adult persons in here either laying in direction of the course or crossing the course, looking out of the porthole window. Besides this, there is no sacrifice in stowage in here. The aft cabins really took me! 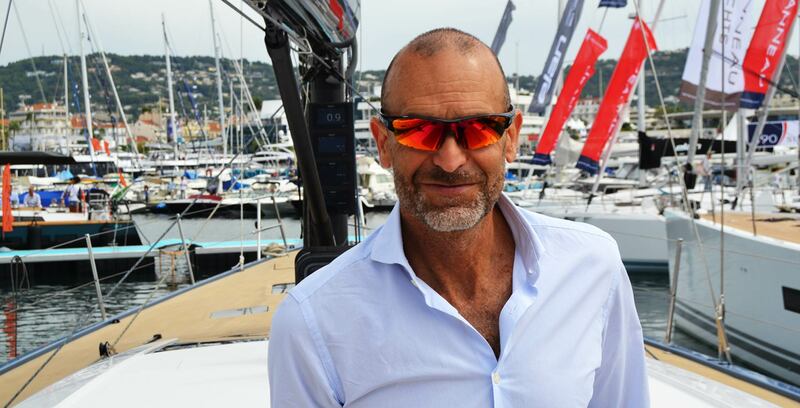 I also had the pleasure to briefly talk to Mr. Marco Malgara, the owner of ICE Yachts who introduced me to the production technology in the yard: High tech carbon fibres in E-glass lamination. That´s for reducing the weight. 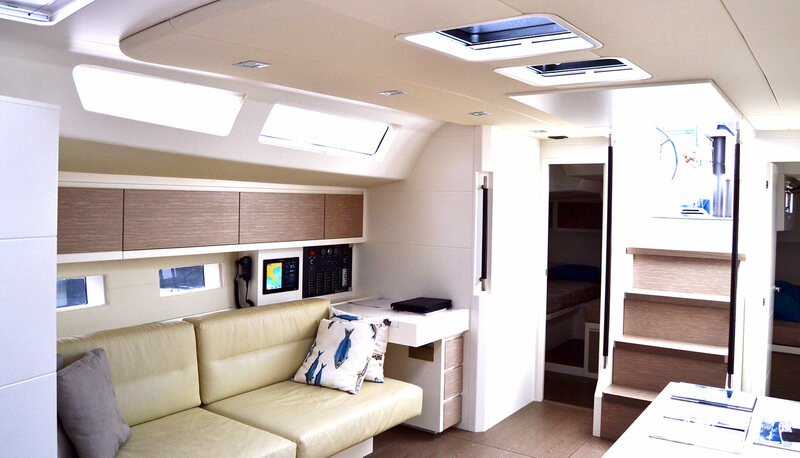 And in fact, the ICE 60 is a true lightweight yacht with barely reaching 18 tons of displacement – on a 60-footer! 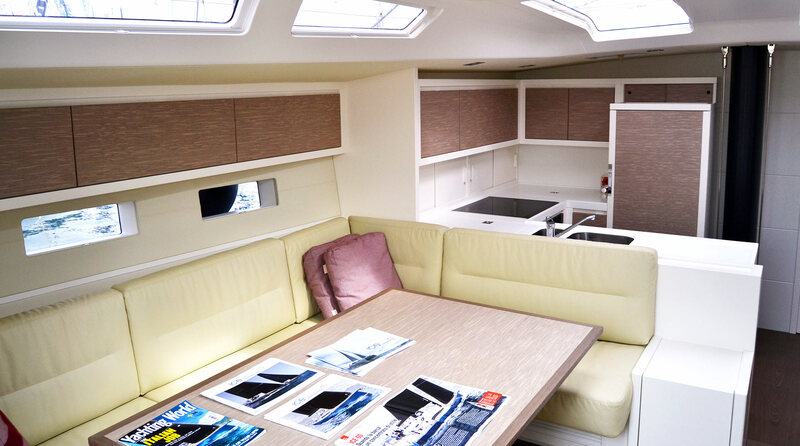 For comparison, the Hanse 588 (despite being 1 metre short of ICE 60) weighs in some 23 tons, the Jeanneau 21.5 tons. ICE Yachts is a small company between Milan and Piacenza in Italy. 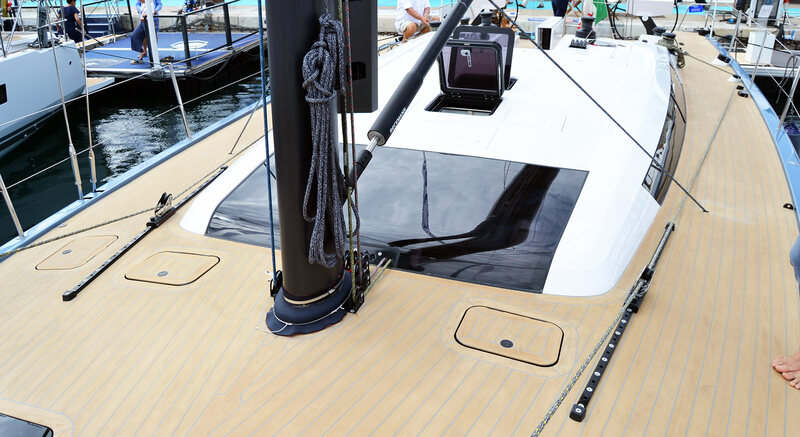 Focused on making semi-custom racing and performance yachts, the yard also manufactures a sporty, 60-feet Catamaran and some very steep looking performance cruisers and true thoroughbred racers ranging from 33 up to 100 feet. Definitely worth a yard visit which is upcoming. Wow! If I was a sophisticated Italian manufacturing magnate this is definitely what I would sail around in…alas I am none of those things. 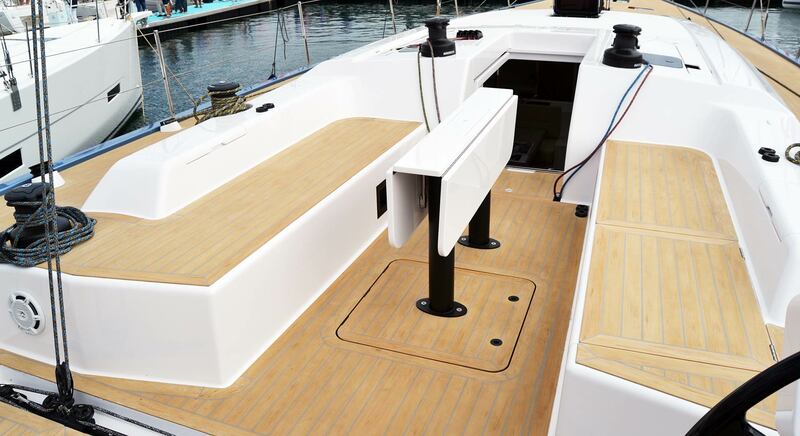 Actually looks a bit like the Swan 60 by Mani Frers, not as classy, but I like, Interior is a mess though!